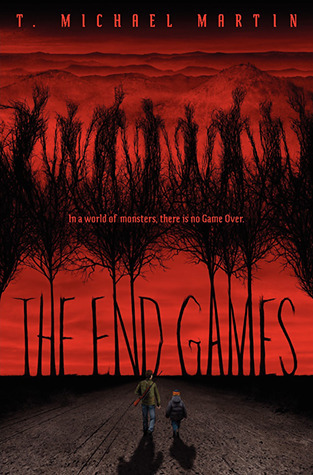 The End Games follows two brother Patrick and Michael as they struggle to find safety in a world overrun by creatures named bellows. The Game needs to be played in order to survive but with obstacles blocking Patrick and Michael at every turn, How will the brothers cope? Especially when the rules are ever changing. The End Games has such a great premise doesn't it? Unfortunately it wasn't executed all that well. If you're going to write about Zombies the book needs to have an element of danger. I never felt that with Patrick and Michael. Sure the "Bellows" were creepy but they didn't feel scary. I think it's The Game element introduced at the beginning that makes them feel less dangerous. Now obviously "The Game" is a big part of the story but once it's revealed that the game isn't what Michael has led us to believe the book goes sour real fast. Now even though I have issues with plenty of things my biggest complaint with The End Games were the characters. Here's the thing, Patrick is a cute little kid but he's also mentally deficient. It's never said what he has exactly but based on his actions I'm assuming it's a form of Autism. I can deal with special kids when they are treated normal but I do not like the way Michael treated him with kid gloves. It's a Zombie Apocalypse if the kid can't handle the realities of the situation maybe it would be best if he wasn't part of it anymore. So much Sh*t happens in the book that was unnecessary because of Patrick but oh no Michael can't yell at him, subdue him or you know tell him the truth because he's "Special". Then right at the end he has this completely personality change where he's "normal" and you know what if he had just been written that way to begin with maybe I could of liked the book more. I also cannot believe how Michael could keep confiding in Holly even though she proved unreliable time and time again. I get it, only a few people are left but still use your brain man. Secondly, I really dislike how the action was toned down. This is a young adult book. I don't need Hostel type gore but c'mon I expect some seriously cool kills. It's like this book was handle with kid gloves in every aspect. It felt more Middle Grade and even then at times it felt even younger. Even the swearing was kept to a bare minimum and when it did happen it was only the adults. The kids don't need to be swearing every page but when they obviously want to they don't instead choosing to keep it G-Rated which of course was awkward to read. Lastly, I simply hated the lack of back story. We do get glimpses of things before Halloween but they almost all deal with Patrick and Michael's relationship with his parents. We also do get clues as to how the Zombie Apocalypse starts but again the execution was lacking. Why did it take a month for Cady to come back? Who was patient zero? How far has this spread? Simply to many questions left unanswered for my liking. Now with that being said I did like a few small details. Frankly these things were just enough to keep The End Games 3 Stars over 2. First off, I really liked the use of a Hot Air Balloon. You just don't ever see those as a means of escape and I've often wondered why more people didn't use them during a Post Apocalyptic scenario. Secondly, the ending was great. I really liked how it was executed and due to almost every character left alive having a sudden personality change I actually enjoyed them. Unfortunately that's about all I liked out of the whole book. In the end, I kept with The End Games in the hopes it got better but when it did but it was just a bit too little too late. Would I recommend it? Yes, but I would strongly suggest borrowing first before buying. I hope that IF the author decides to make a sequel he keeps the characters how they were at the end. Even though I didn't love the book, I do think The End Games should certainly have at least a sequel. I would like some more of the questions answered regarding how far and wide this spread, Where's Michael and Patrick's mom? Did Ron Survive? Plus the ending certainly felt left on a cliffhanger vs. concluding the book as a stand alone. Therefore with that being said, I will be rating The End Games by T. Michael Martin ★★★ .